Ice is my friend. In fact, ice is a pretty popular commodity in our house. When the boys were little, they use to scream “Ice! Ice! I need ice!” for any little boo-boo; oddly enough, they both would have nothing to do with bandages. I clearly remember one trip to the drug store being that much more exciting with the simple promise of buying an instant icepack for my gear bag. Even today, for my teen and tween, ice seems to fix all of their aches and pains. Before we left for the hospital, I told my husband to get a roll of paper towels and fill a bag with ice. “They have ice at the hospital,” he laughed. “We have to drive there and I need ice now.” Dave understood that tone and got the ice. Just over half an hour later, I still hadn’t seen a doctor and I was running out of my “wonder drug.” Dave asked the nurse for some. We waited. Fifteen minutes later, he asked again. Still no ice. Finally, Dave asked the nurse, “Where is the ice machine so that I can get it?” He came back with a cupful and he continued to get his own refills until I was admitted. After the doctor diagnosed a broken jaw and I was hooked up to an I.V., he proceeded to stitch my chin. “Umm, you’re stitching my chin?” I questioned. “But you haven’t washed my chin yet,” I said. Week 2: Clean but still swollen. “I’m not worried about infection,” I thought. “I’m worried about dirt being stuck underneath and my chin looking dirty for the rest of my life.” I refrained. Later, I realized that my chin probably was spotless because it had been drawing in ice for a few hours. The next day, the oral surgeon told me to expect my chin to turn black and blue “right down to the clavicle.” It didn’t. It only ended up being a greenish-yellow, probably thanks to my vigorous icing. 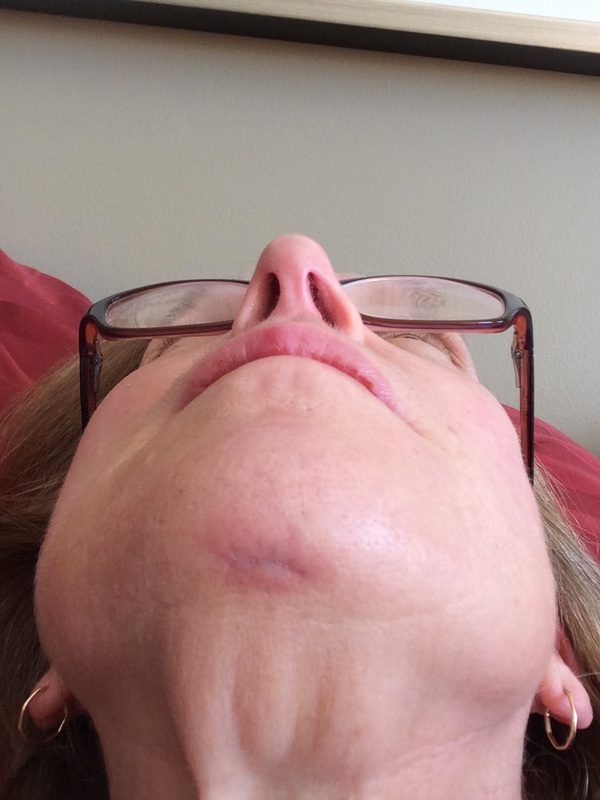 Everyday for the past 8 weeks, I have tried to peek under my chin to see exactly how I have healed. The doctor was right; he was careful with my face. But I can’t help but wonder whether there is any dirt trapped under the flesh or not. Fortunately, I’ll never really see whether there is or isn’t. Sadly, though, 90% of the population I deal with from day to day stands below five feet tall. Hopefully, they’ll never notice too.